"Soft matter" is a generic name for materials such as polymers,liquid crystals, colloids, emulsions and biological materials. Among the places where its presence is ubiquitous is in the food,cosmetic and electronics industries and its absence would make modern life unthinkable. The main objective of our project is to clarify the structure, formation and non-equilibrium states of the assemblies of these soft molecules under various external fields, flow fields, electric and magnetic fields, mechanical stresses and optical illuminations. 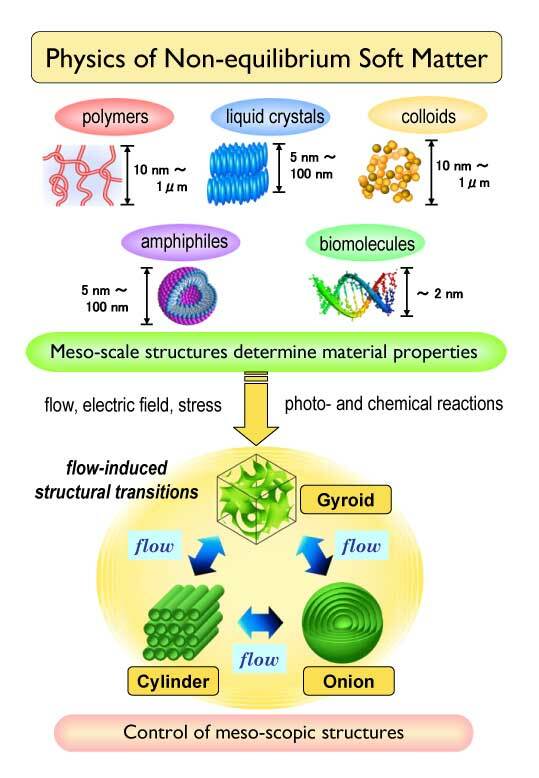 We approach these questions by means of experiment, theoretical investigation and computer simulation of the structure and dynamics of mesoscopic systems.